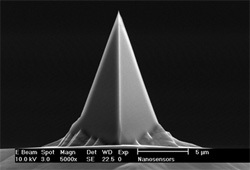 NANOSENSORS™ PPP-CONTPt AFM probes are designed for contact mode (repulsive mode) AFM imaging. 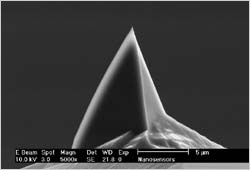 This AFM probe can also be used for force-distance spectroscopy mode or pulsed force mode (PFM). The PPP-CONTPt type is optimized for high sensitivity due to a low force constant.